Katy Chang, Director of ‘Glitter Dust: Finding Art in Dubai’ shares her experience making her first feature–length documentary, along with the Producer, J.R Osborn. Finalist for the Gulf Feature Competition, the film hopes to propel the art scene in the region as the makers share their thoughts on their work, Dubai and what audiences can expect from their movie. 1. Your previous film ‘Nanjing Road’ was based in Shanghai. How was the journey from Shanghai to Dubai in terms of shooting Glitter Dust?Katy Chang: The journey from Shanghai to Dubai has been great! Dubai has helped us cultivate a lot of relationships while shooting the film. We had a lot of University students interning and assisting us during our shoot. In fact, everyone was surprised how our film was an independent film. We actually started filming the second day after we landed and it was a great experience. We learnt everything about the city in a week. 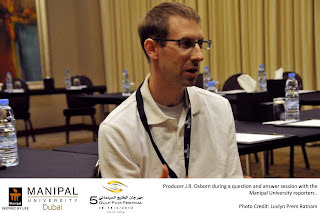 J.R Osborn: I had been studying in the Middle East, Yemen and Jordan, but had never been to Dubai. When I did come here, I started off as a professor at the American University of Dubai. We noticed there were no stories about the art scene in Dubai, about the culture. We felt that it was important to capture the essence of art in Dubai. 2. Did you face any difficulty while filming in Dubai? 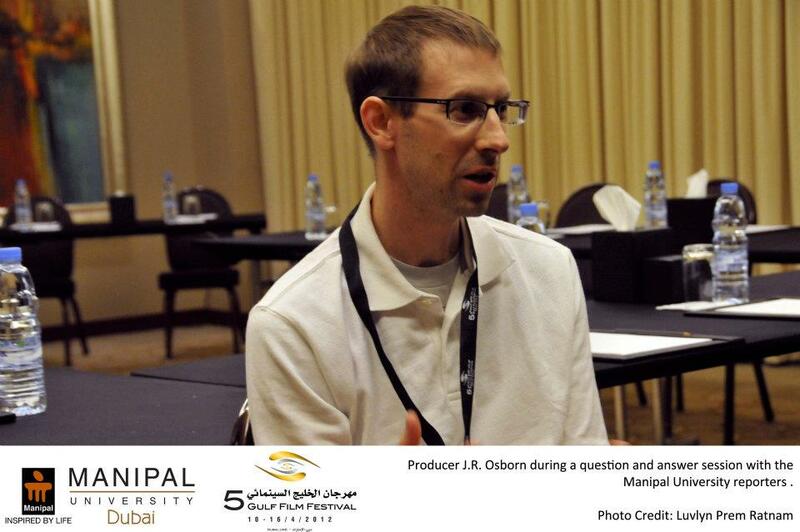 J.R Osborn: The only difficulty we did face were the sandstorms, other than that everything went smoothly. 1. What stirred you to make this film? Katy Chang: As the art scene in Dubai was not given much focus, through this documentary, we tried to bring out the art and culture of the Dubai. This is for all those art lovers out there, as well as for everyone else. There was no script as such for this movie. It was their own voice and story. 2. Your interest lies in filming food. Are you an avid cook too? Katy Chang: Yes! I love filming food. Cooking is something I’m passionate about and enjoy it. The fresh spices and different types of cuisine that I try out, the whole feel of cooking is just great! J.R Osborn: She’s made an award winning ‘Kim chi’ (a traditional Korean dish). 3. Do you plan on expanding your production studio? Katy Chang: Yes, definitely we are planning to expand. We are looking out for gallery space, as well as planning on having a kitchen. It is going to be more on a creative base. 1. What is your next project about? Katy Chang: My upcoming project is based on food. The project’s name is ‘Baba – Cooks’. It’s more on the personal level, since it is based on my father and how he survived the Great Chinese Famine, and overcame all the difficulties to become a chef. 2. What advice can you offer budding filmmakers, especially students in the region? Katy Chang: There is a definite scope for the students to explore and make new movies. They need to look at things differently and tell a story through that.